We’ve Moved to 85 S Main Street! 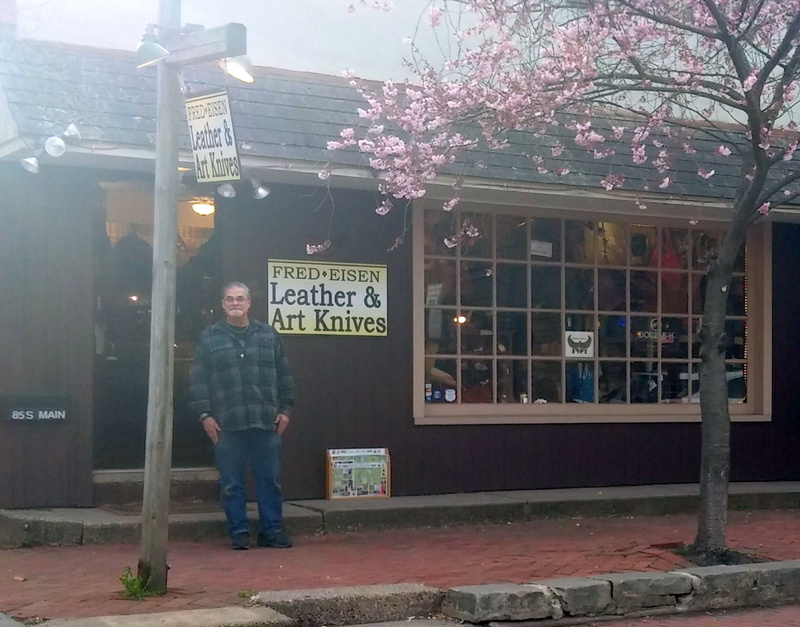 Visit our NEW leather shop in New Hope PA! Call for extended weekend hours in season, until 9pm on Friday and Saturday evenings. FRED EISEN LEATHER DESIGNS opened the door in 1978 on Montague Street in Brooklyn Heights, NY. After 12 successful years, we moved to New Hope, PA, where we’ve been for the past 20 something years. Last year, we changed our New Hope location from 129 to to 85 S Main St, moving closer to the center of town, near the Visitor’s Center. “Both Brooklyn Heights and New Hope have been the most wonderfully accepting, artistic communities to be a part of,” says Fred. 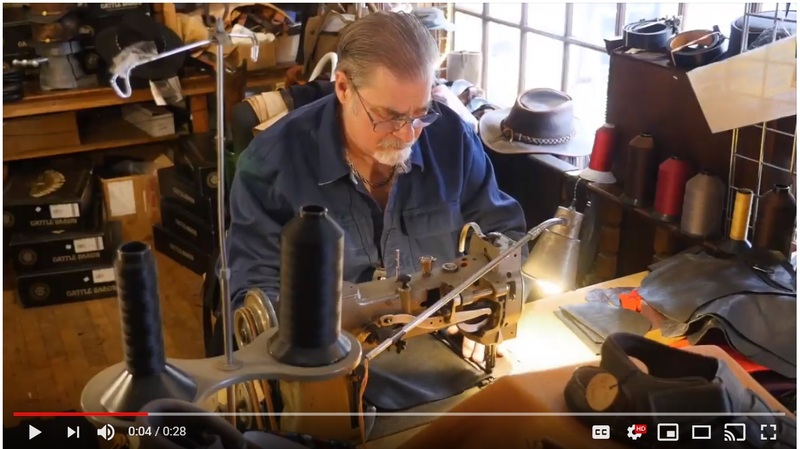 “It has been our goal to create fine quality and interesting leather products of all kinds.” Fred is happiest when he is at the sewing machine, creating new and exciting leather goods. His new machine, which he nicknamed “The Beast” enables him to create the knife sheaths he has always wanted to do, but couldn’t. He is always thrilled to have his Brooklyn customers from 30+ years ago visit to show him how well his bags have held up. Buy a commemorative T-shirt that Lea designed, along with a new bag, just to keep us in business. We know they don’t really wear out and our styles are classic! Sharon Flanagan has been an important part of FRED EISEN LEATHER & ART KNIVES on an ongoing basis for many years. She was a seamstress and tailor for numerous years, and “one of the finest leather craftsmen I have known,” says Fred. Sharon studied Fashion Design and Art at Pratt in NY, then had her own shop in Greenwich Village for 8 years, “The Scarlet Leather”. She, too, eventually moved to New Hope, where she worked with Fred, doing custom clothing and repairs. 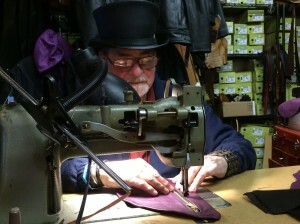 www.fredeisenleather.com and www.artknives.com, with Fred’s photographs and loving encouragement. She stopped doing leatherwork after 30 years, and is now happiest when doing micro-macrame jewelry or on the computer. She helped create and design our new store, and administrates and co-chairs the New Hope Arts & Crafts Festival. 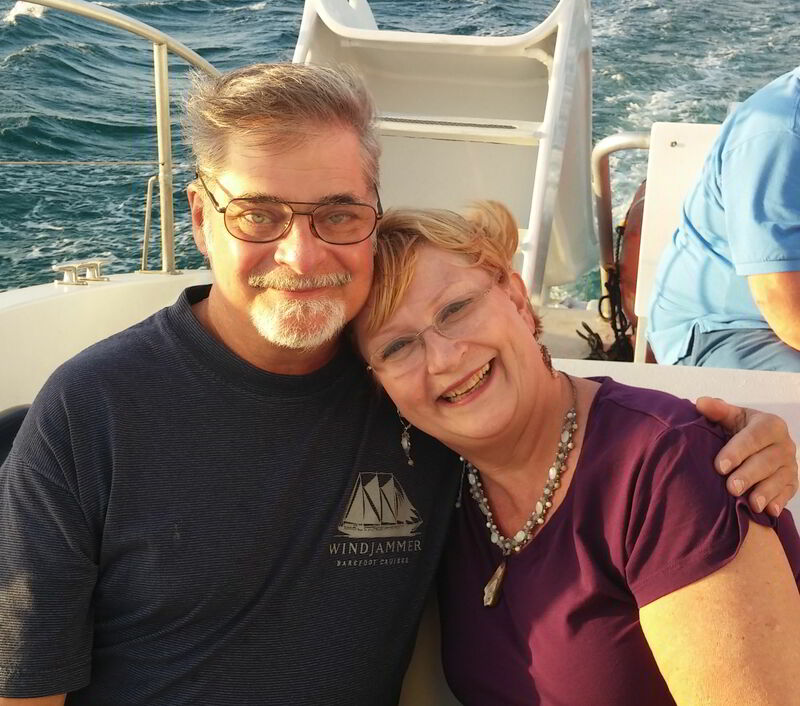 Together Fred and Sharon have formed a marriage of skills and ideas that have enriched both their lives, and they were actually married in 1999. This is also reflected in the continuing new energy of design we bring to you, our loyal customers. You can search for us on Instagram, too.